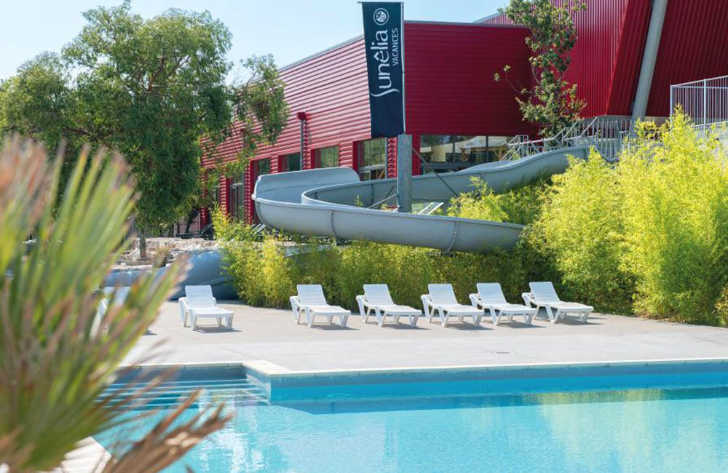 Aluna Vacances is an action packed 5 star family friendly campsite that’s located deep within the Ardeche countryside. Situated on a wooded hillside, Aluna Vacances covers an area of around 15 hectares hence offering plenty of space where you can relax and have fun. The campsites facilities and activities are second to none and will ensure that all members of the family are kept happy. The Ardeche region of France is well known for its incredible countryside and plethora of outdoor activities that are available. Aluna Vacances is well placed to make the most of the natural environment that surrounds it. Cycling and walking is highly popular due to the number of tracks for cycling and walking that are nearby. Furthermore there are plenty of opportunities to experience activities such as canoeing, kayaking and white water rafting because the river and Pont d’Arc are just 16km away from the campsite. Aluna Vacances swimming pool complex really is fantastic. On site there’s an indoor complex offering a plethora of swimming opportunities. There’s a heated lagoon styled swimming pool, a jacuzzi, spa and an outdoor pool complex that are interlinked by walkways and rivers, waterfalls, slides, children’s play area and plenty of sunbathing areas. Aluna Vacances really does pull out all the stops when it comes to the range of on site activities and facilities it offers ensuring you have a fabulous holiday. On site activities at Aluna Vacances include tennis, table tennis, football, badminton, basketball, volleyball, boules, playground, aqua gym, spa and cycle hire. Facilities available at Aluna Vacances include WIFI, restaurant, takeaway, creperie, bar, groceries, animation team, games room, tv room, washers and dryers. Accommodation at Aluna Vacances campsite includes a range of 2 and 3 bedroom mobile homes that are available from Eurocamp.